Back in the early eighties, New Wave music was making it way to mainstream radio with acts like Blondie and Talking Heads blowing up with hit singles. 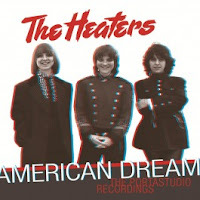 Record labels were searching for the next new act to be discovered and one band that was making waves on the west coast was The Heaters. In the late-seventies they opened for bands like Van Halen and Cheap Trick and were ready to become the next big act in the U.S., but their studio albums became commercial failures. Having never given the credit their music deserved, Omnivore Recordings will be releasing a new compilation from The Heaters titled, "American Dream: the Portastudio Recordings." It's an undiscovered gem from 1983 that showcases the pinnacle of The Heaters in the studio. The new ten track release features all previously unreleased material, beginning with "American Dream." Their music reminds us of that magical period when doo-wop, girl-groups dominated the radio airwaves in the fifties and sixties. The Heaters combine a steady rock rhythm with wonderfully harmonizing vocals in "10,000 Roses" and with "Every Living Day," they make you forget what era the Heaters were from. It's amazing to think that these recordings have never seen the light of day until now, as songs like "Just Around The Corner" and "I Want To Love Again" have a timeless quality that expands over generations. They close the album with the rockabilly feel of "Rock This Place" and the classic sixties swing of "I'll Meet You There." To find out more about The Heaters and their latest release "American Dream: The Portastudio Recordings," please visit omnivorerecordings.com.